It is an exciting time to be a part of Theatre Sarnia! 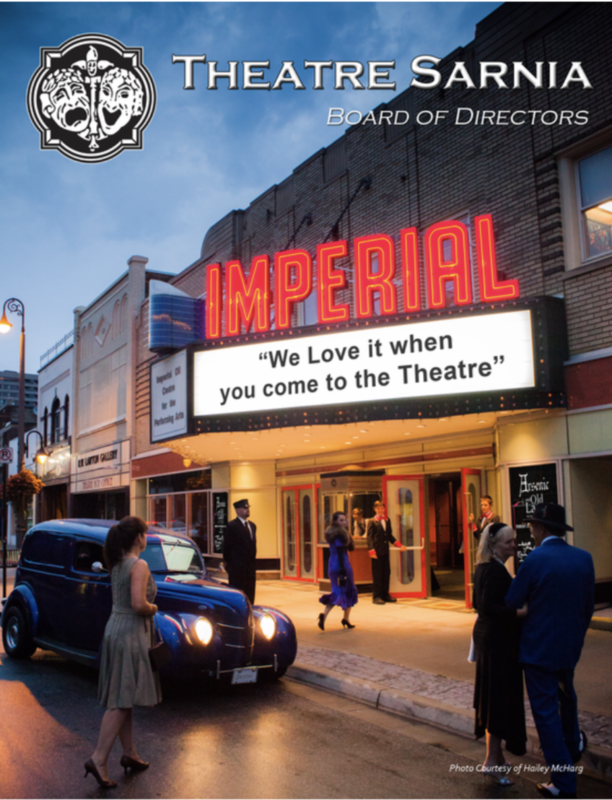 Theatre Sarnia, established in 1927, is one of the oldest continuously operating Community Theatre groups in Canada and is the owner and operator of the Imperial Theatre. It is a completely self-funded, not-for-profit registered charity. To develop and support art and culture in Sarnia and Lambton County. To foster the appreciation and presentation of the performing arts. To manage and maintain the premier entertainment/community venue in Lambton County. To encourage the development of artistic expression by other community partners. To present the widest range of performing arts through partnerships with professional promoters, agents and artists, for the benefit of our community. the performing arts have the ability to touch,affect and change individuals. we have an obligation to encourage the highest quality productions in our theatre. the people engaged in our organization are our most valuable asset. the safety and security of all staff, volunteers and patrons is critically important. An opportunity to exercise leadership skills by participating in the governance and strategic decision-making processes of the organization. A platform to network with people who have the same passion for local community services in a positive team oriented environment. Be residents of Sarnia Lambton and support the vision, mission and values of Theatre Sarnia. Reflect the vibrant diversity of the community we serve. Be familiar with or show an interest in a governance-based Board of Directors and non-profit organizations. Your submission, including all required documents, must be received no later than 5 p.m. Wednesday, August 15, 2018 . We will only accept complete applications. Click here for our Board Recruitment Package / ApplicationCopyright © 2017 Theatre Sarnia All rights reserved.